Cake Pops by Tisha & Kat's Sweet Shop have great sweets and cute cake pops and bagged candy for a quick treat for lunch or something for the kiddies. Kat & Tish will be open Friday and Saturday. DragonStone 1 & 2, sharing his eclectic love for gemstones, rocks, antiques, and assorted other items he has on display. Mike will be here all weekend. Eberly's Emporium is open Saturday & Sunday. Terry & Larry sell mystical dragons & fairies, don't forget incense too! Fetter's Findings is open with an variety of wind chimes to choose from as well as different styles of jewelry. Tom or Avalon are here Friday, Saturday, and Sunday. Jo's Seasonal Selections will be open on Saturday, September 9th. Catch her on that weekend when she brings in corn, tomatoes, lettuce, radishes, zucchini, cabbage, etc. KiLoke Deli & Coffee Shop, Dee specializes in making deli sandwiches and homemade deli salads. In addition; she creates different fruit lemonades & iced teas. If its coffee, cappuccino, or lattes you are looking for Dee can help you! Her specials for this weekend include French Toast or a 3-egg Omelet, and Home-made Ham & Green Beans. Laurie's 717 Catering LLC offering you a Fish Sandwich Platter. All platters come with a side. Sides to choose from will be Crab macaroni & cheese, collard greens, or french fries. Try out her Soul Rolls that make you want more of them! Stop in and try out some good eatin'! Mad Kat Crafts, Kat offers a variety of tealight mason jars and a selection of birdhouses her daughter painted. Kat is open Friday and Saturday. Moon Family Studios stand holders Missy & Penny have some new products on display. Check out the Special of the Month Hutch. Natural Dream Catchers, created by Gwen. She has an array of different shapes and sizes of dream catchers. Gwen is here Friday and Saturday. Paracord Genesis, Rob has a great selection of Paracord Bracelets and key fobs. He will create any special orders for you if you don't see something you like on display. Terram Olei sells a variety of doterra Essential Oils. Sophia has an array of tumbled stones, Himayalan Salt Lamps, Chakra bracelets and Chakra necklaces. She will be open Saturday and Sunday. Chris Rhodes from The Lavender Shanty has a host of baskets to choose from, which she personally weaved. In addition, she has a variety of potpourri, dried fruit, and Spring/Summer type decorations. Chris is now offering freshly made Lavender Lemonade (personal favorite)! The Wild Batch, has a great variety of crepes and all are made to order. Gerrianne makes wonderful old fashioned eclairs, little pies, and a selections of other baked goodies. If you like soft pretzels, then you need to stop in at Windy Lindy's Olde Columbia Pretzel Haus has the best around! Offering freshly baked pretzels, pretzel nibblets, mini dippers & Cinnamon sugar pretzels. In addition; they make deli sandwiches on pretzel dough! Linda and Andrea are here all weekend. Stop in this weekend Friday through Sunday 10am to 3pm this weekend! Free parking is available behind the Columbia Historic Market House and in a public parking lot 20 feet from the market house on on the left hand side of South 3rd Street. Areas outside of these public lots have metered parking and require quarters for Friday and Saturdays. 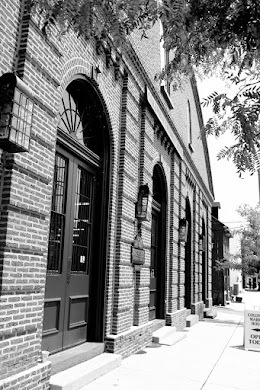 Columbia Historic Market House (c) 2013. Picture Window theme. Powered by Blogger.